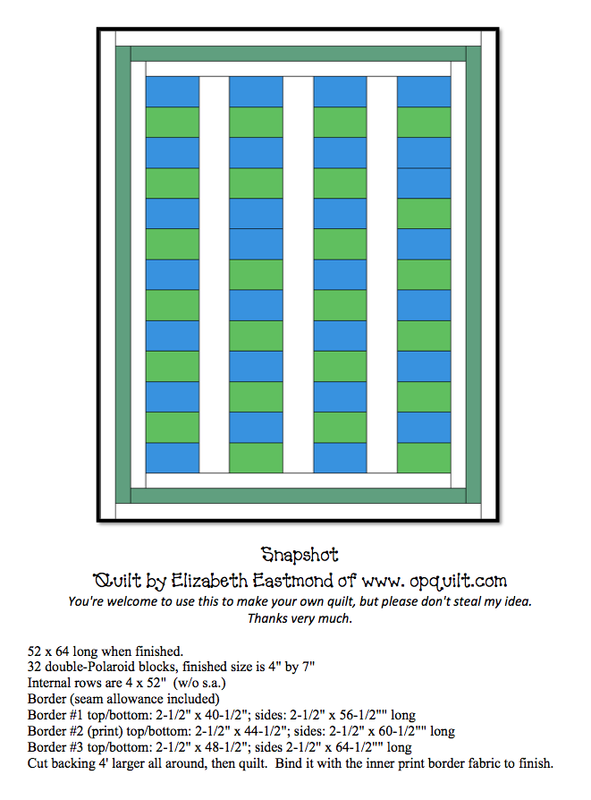 Snapshot: Putting the Quilt Top Together | OccasionalPiece--Quilt! 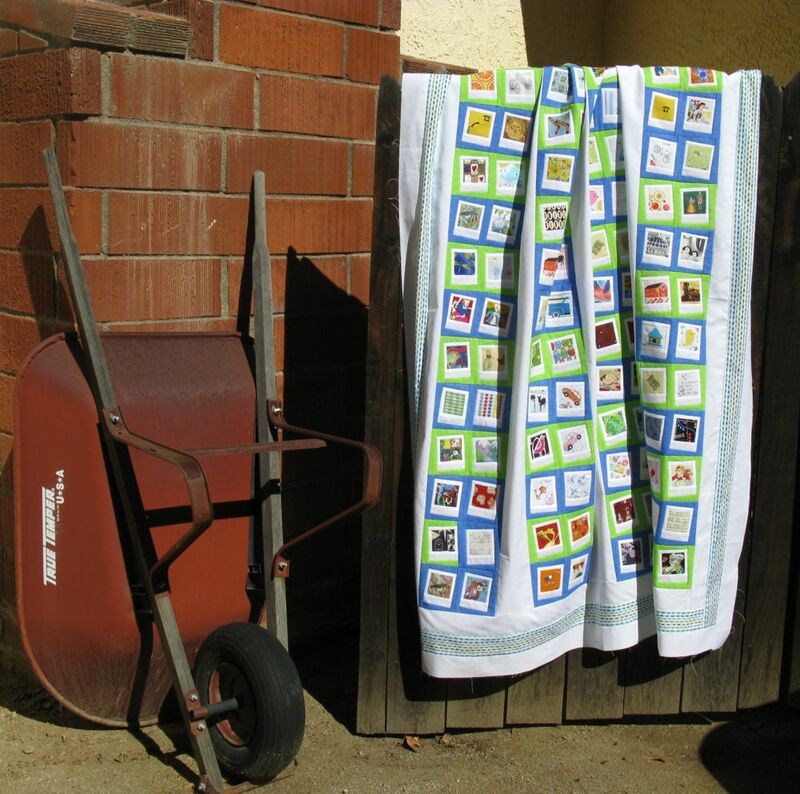 Posted on October 19, 2012 by Elizabeth E.
Here’s my Snapshot Quilt, in the requisite rustic pose drooping over a gate with rusty wheelbarrow. Go yard work for great props. 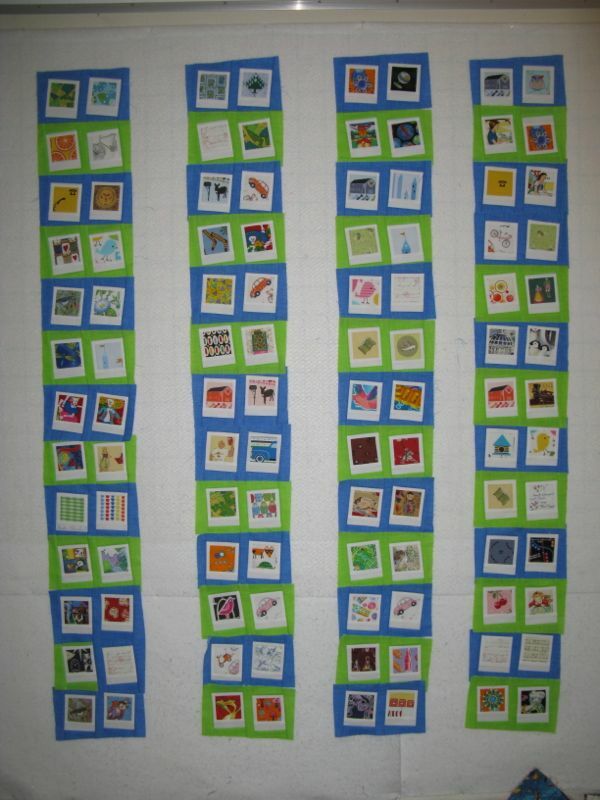 This is the third and final post in my tutorial of how to make the Snapshot Quilt, constructed from lots of Polaroid blocks. And at the end, my little giveaway. I have three sets of 10 blocks each to giveaway, but hey! you must be a serious Polaroid-er to get them. Leave me a comment telling me what you’ll do with them–have you started your collection? Do you have a few and want more? Do you have plans for them? And for fun, tell me about your favorite vacation photo, since this quilt is, after all, a tribute to vacation photos everywhere. Here’s a close-up of some of the Polaroids. I received the truck Polaroid in the swap. Love it! And that German-looking couple on the right was cut from my Barbie-doll dress. 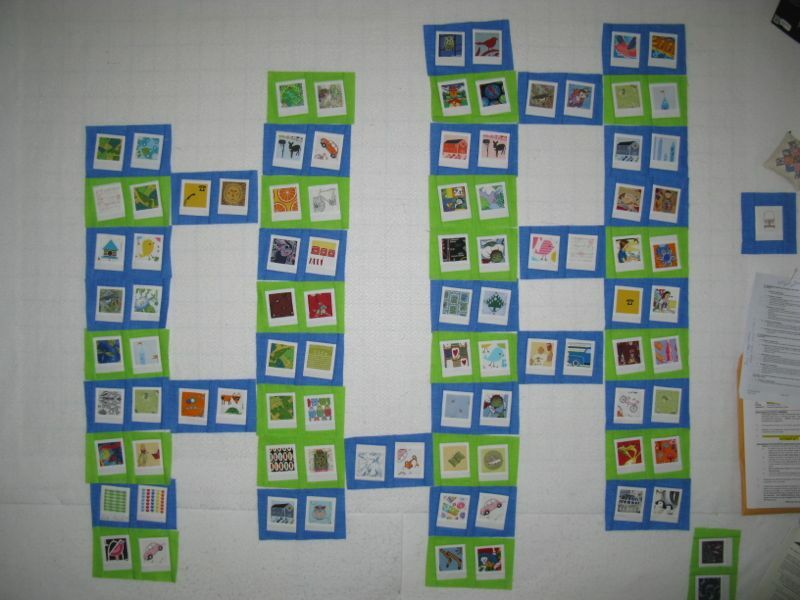 Start throwing up blocks onto your pin wall. This was my first attempt. I knew I wanted a stacked coins effect, but was playing around with inserting blocks into the middle of the stacks. Meh. Second try. I like this one better, but not keen about the four blue blocks across the top, so I switched them around. Check the previous post for the doctors-office-view of the quilt, which shows how I ended up arranging all my blocks. I also checked to make sure that there wasn’t a glob of orangey-red blocks, or too many of one type or color. 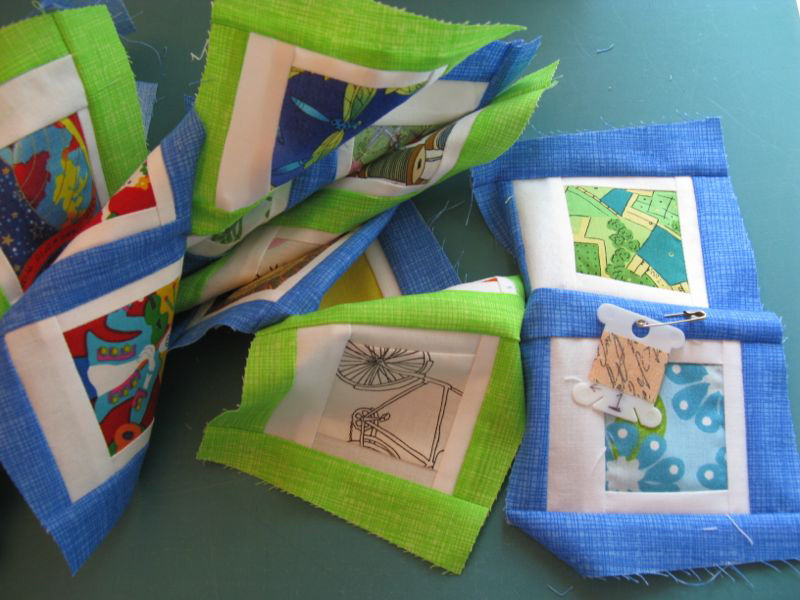 After getting the blocks the way you like them, sew them together. My row tags, made from embroidery holders, indicate which row it is, and which is the top. I pinned them all together in a row, then stitched them. Internal rows are 4 x 52″ (w/o s.a.) so cut three strips that are 4-1/2″ by 52-1/2″. I’d STRONGLY advise cutting them on grain, that is, cut them parallel to the selvages of your white fabric. All these double-Polaroid blocks are slightly on the bias, so they need the strong stable edges of an on-grain piece of fabric. NOTE: I’d cut the border pieces slightly longer, to give allowance here and there for ease needed when sewing on borders. Matching centers and edges, ease the stacked quilt blocks onto the white on-grain strip of white fabric. Repeat until four rows of stacked quilt blocks and three strips of white fabric are sewn together. I sewed the seam with the quilt blocks to the throat plate of my sewing machine, allowing the motion of the feed dogs to help ease in any extra fabric. 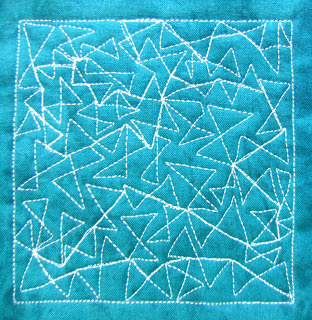 Sew on the first top border, then the bottom. Then, matching centers and edges, sew on the side borders as you did above, keeping the white strip UP and the quilt block stack to the feed dogs. 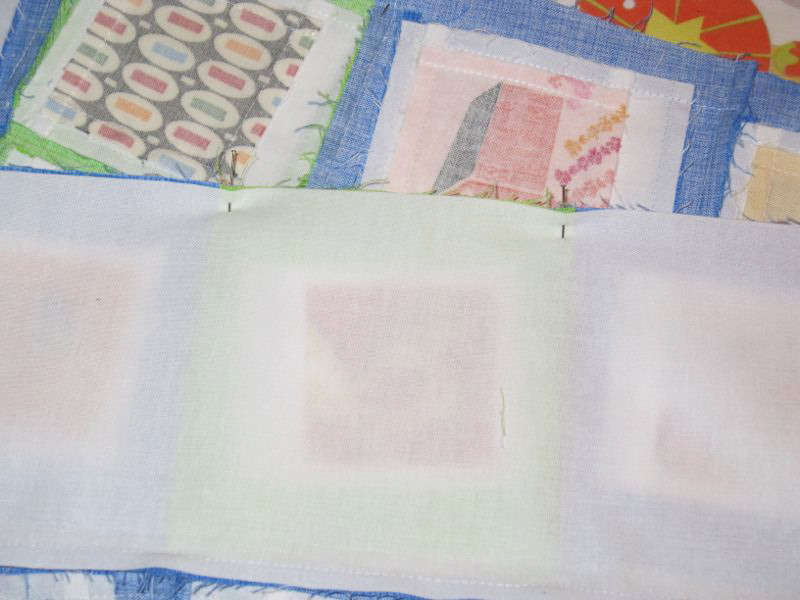 Press seams toward quilt blocks. Attach the print borders next in this order: top, bottom, side, side. I was exacting on the lengths and matching edges and centers, but I should have given a little more ease to the side borders. It’s a challenge sometimes, as you don’t want to get the borders too small so that the quilt “bows” with a curved edge, but you also don’t want it so loosey-goosey that it ripples. Pin and check, is my advice. Then press the seams toward the print fabric. Lastly, attach the last white borders in the same order: top, bottom, side, side. Press toward the second (print) border. Go and visit Leah’s site for lots of ideas and a stimulating blog. I love reading her posts. I do plan to bind this with more of that print shown in my border. Now! Leave a message if you are interested in scooping up some of my Polaroid blocks, and mention what you’ll do with them–have you started your collection? Do you have a few and want more? Do you have plans for them? 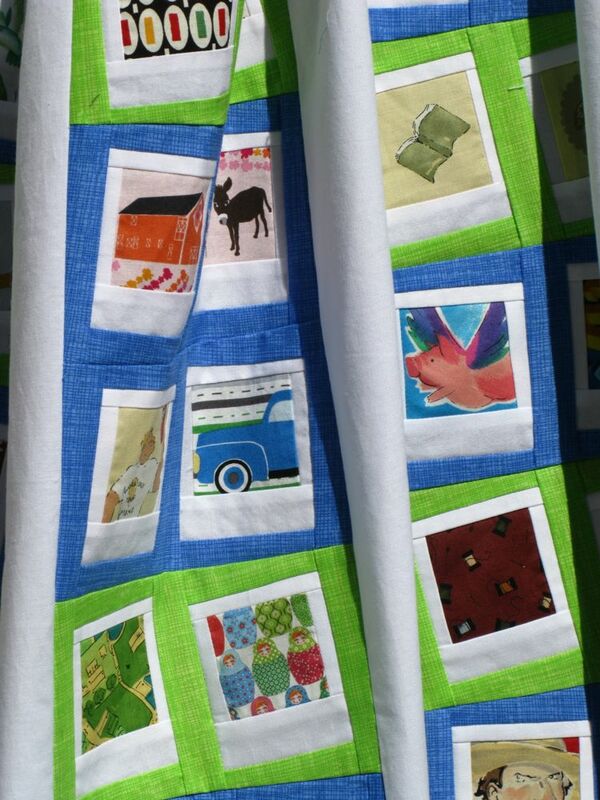 And for fun, tell me about your favorite vacation photo, since this quilt is, after all, a tribute to vacation photos everywhere. 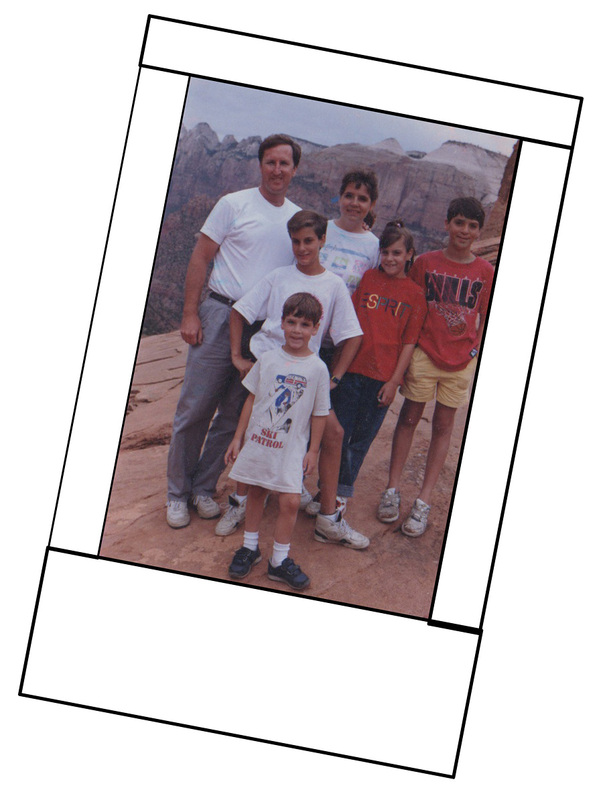 Mine favorite vacation photo is from when Dave and I were newly married (under a year) and we took all the kids to Zion National Park. We are standing there in the middle of red rock country in our slightly dirty T-shirts, a group of 2 adults and 4 children who were on their way to becoming a family. Now let me hear about yours. UPDATE: Congrats to the winners of the Polaroid Blocks: Mary, Cindy and Marilyn. I’ll look forward to seeing what they do with their blocks, so send those photos over to my email when that future finish day arrives. I love your quilt! I have started to collect some Polaroids but so far have four. I need a serious incentive to get me going. I look at fabrics and can’t make up my mind if they will work. My favorite holiday picture is of my husband playing on the beach in Hawaii with our grandchildren. The sun is setting, the colors are fantastic, and the subjects are my favorite people in a wonderful place. How can it get better than that? Wow, I never thought of this great idea. What a wonderful way to actually use all those photos from previous vacations you want to remember. 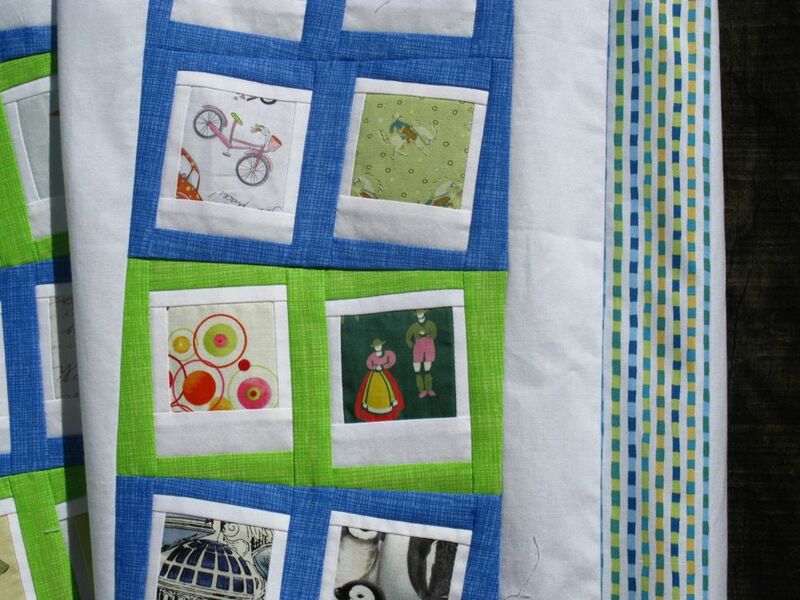 Why not mix in some real photos, interchanged with beautiful fabrics to give the quilt some more color and eye candy. I would love to win a batch of these beautiful photo blocks. They will be mixed with my vacation picture blocks and hanging on my wall for display in no time! Probley a bed and a wall! Dear Mr. Random Number Generator (or Mr. OP, or whomever is doing the choosing) please PLEASE choose me. I have only twenty polaroid blocks. I am in dire DIRE need of more. I would be ever so happy to win some more of these fabulous blocks. I promise not to procrastinate or put them in a pile to be forgotten. Your quilting friend who always stays right on top of things and never ever has too many other WIPs. P.S. My favorite pictures are those taken in front of the entrance at Disneyland.